The top highlight on this 4-day Uganda Gorilla Safari is of course African Mountain Gorilla Trekking in Uganda’s Bwindi Impenetrable Forest. The Uganda gorilla trek takes us through the dense jungle to encounter the endangered mountain gorillas in the wild. Bwindi Forest is also known for its high biodiversity and excellent bird watching. Experience one of Africa's most magical wildlife encounters - seeing the rare mountain gorillas in the wild, as well as trekking chimpanzees, spotting other wild animals and gaining insight into the cultures of Uganda. 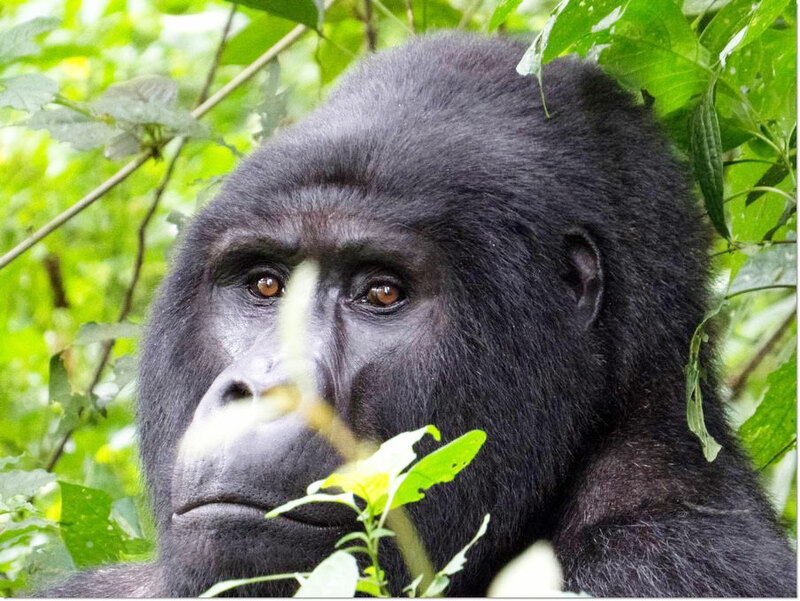 Our 4 Day Uganda Gorilla Trekking Safari departs from Kampala, the capital of Uganda. Leaving Kampala we drive through the dense jungles and papyrus wetlands of the Nile Delta. We pause for lunch en route to the Kibale National Park, near the towering Ruwenzori Mountains, known as the Mountains of the Moon. In the afternoon we embark on a guided walk in the national park, exploring the crater lakes area and experiencing the local culture. Tonight we have dinner and stay over at a scenically located lodge on the edge of Kibale Forest, overlooking the lush forest and legendary Mountains of the Moon. Our day starts early, with chimpanzee tracking in Kibale National Park, home to an impressive 500 chimpanzees. Before heading into the forest we are briefed on the trekking procedures. While trekking in the jungle the guide tells you more about the chimpanzees, other primates and local flora and fauna, making for an interesting adventure. The dense jungles of Kibale Park are the best place to view chimpanzees in Africa. The chimpanzees are commonly found feeding on fig tree fruits in the game park and have been habituated to humans since 1992. Kibale National Park covers 795 km² and consists mostly of a vast tract of equatorial rainforest. This national park is home to numerous forest wildlife species, boasting one of the highest concentrations of primates in the world. The 13 primate species include include rare I’Hoest’s monkeys, black-and-white colobus and Uganda red colobus monkeys, red-tailed and blue monkeys, grey-cheeked mangabeys and bushbabies. In the afternoon we travel south to the Queen Elizabeth National Park, taking in the sights and looking out for game as we drive. Our next destination is Bwindi Impenetrable National Park, home to the endangered African Mountain Gorillas, along with a rich diversity of wild animals, insects and plants. Inhabitants include various other primate species, such as the blue and red-tailed monkeys. This evening we relax and have dinner at a charming community lodge looking out over the green hills near Bwindi National Park. We stay in twin-rooms with private bathrooms, some featuring decks overlooking the lush forest surroundings. On day three we rise early for breakfast, before the gorilla trek briefing at 8:00am by rangers from the Uganda Wildlife Authority (UWA). We then set off on our African Mountain Gorilla Trekking adventure in the Bwindi Impenetrable Forest. Gorilla trekking is the highlight of visiting Uganda and one of the most memorable wildlife experiences in Africa. Embarking on this once-in-a-lifetime wildlife encounter we will view the highly endangered mountain gorillas in the wild. The guides lead you into the bush, pushing through the undergrowth to track the Bwindi gorillas. This gorilla walk can take up to 6 hours, so a reasonable degree of fitness and a sturdy pair of walking shoes are a must. Take a rain jacket, water and snacks along with you, but be sure to leave nothing behind in the forest. After our rewarding trek through the jungle we sit in the forest among the gentle mountain gorillas, listening to them communicating with one another and watching them interact. Marvel at the sheer size of the dominant adult male gorillas, called Silverbacks, savouring one of Africa’s most poignant wildlife encounters. After lunch in the forest we take a well-deserved rest or enjoy some bird watching. Then we return to our intimate lodge to relax and recuperate after our unforgettable gorilla trek in the Bwindi Forest of Uganda. In the afternoon we take a guided walk in the Buhoma Village to gain insight into the lives of the local people, living in the area around the Bwindi Impenetrable Forest. This walk is part of an initiative that empowers the local people benefiting from tourism. The informative village walk starts from our lodge and allows visitors to see how ingenious the local people are in their day-to-day lives. At the end of the day we have dinner and unwind at the community lodge. On the final day of our Uganda Gorilla Trekking Safari we have an early breakfast before making our way back to Kampala and then Entebbe. We travel via Mbarara and the Igongo Cultural Village where we encounter the Ankole and Bahima people. At the Igongo Center we get a glimpse of the culture and ways of these Ugandan people, learning a bit about their history. Lunch is enjoyed en route and we pause at the equator in Uganda to take photographs before continuing to Kampala and Entebbe. Airport drop-off can be arranged free of charge, if you are flying out on the last day of the safari. Pre and post tour accommodation can be arranged by request.